Protecting your static caravan is very important. This particularly applies if the caravan is only used for your own holidays and left empty for the remainder of the year. UK static caravan holidays are fast becoming the preferred option for many families who are restricted as to when they can take their children on holiday. Owning a holiday home in the UK is much more convenient when you consider the hassle of travelling abroad with kids. In peak periods such as half term and school holidays, the cost can be prohibitive too with flights and accommodation abroad at a premium. Nevertheless, protecting your static caravan and its contents when you are not using it makes logical sense. Whilst most UK holiday parks have onsite security here are some things you can do for additional protection. This may seem obvious but you would be surprised how many people forget to lock caravan doors and windows. Often in a rush to pack the kids in the car and get back home, it’s easy to forget the odd window! If your static caravan doesn’t have double glazing consider fitting it. Modern caravans are usually fitted with double glazed windows as standard. Older models don’t and therefore windows are less secure but it’s not difficult to fit new locks to them. In hot summer weather, it may be tempting to leave windows open at night when you are in the caravan. If you do use stays so that they are not completely open. Fit a security chain to the door and make sure it is enabled when you go to bed. If anyone tries to break in by picking the lock, they will find it hard to get past the security chain. Installing a motion sensor light to the outside is a great way to deter burglars. When your pitch is flooded with light, it’s unlikely they will run the risk of being seen. These security lights can be purchased at places like B&Q and are reasonably priced. If you are away from the caravan or staying in it, an alarm is a great deterrent for intruders. It will be heard all over the holiday park alerting staff and neighbours to a problem. In most cases, intruders will run away. Some alarms come with an app for your smartphone so that you will be alerted if the alarm is activated. Check if your Holiday Park is a member of the local “watch” scheme. Parks that tend to, have fewer instances of theft and damage. Does the Holiday Park have security staff monitoring the caravans regularly? Is there an on-site alarm system and do they have CCTV? Does your park work with you to reduce the risk of theft and vandalism? Is there property marking available and are your home contents entered on a property register locally? Property marking is a great scheme because it assists the police in bringing prosecutions and returning stolen property to its rightful owner. At the end of the season do you empty your Holiday Home of valuable possessions? We know it can be a lot of hassle but the fact of the matter is that if valuable aren’t there, they can’t be stolen! 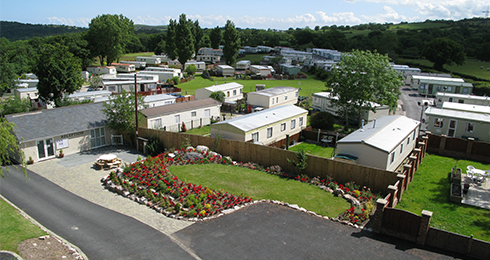 Naturally, if a Holiday Park doesn’t have all of the above it shouldn’t deter you from pitching your Static Caravan there but clearly, it’s a real bonus if some of the schemes are in place. It’s also good to know that the Holiday Park management takes security matters very seriously. We advise you to mark and register your valuable possessions and let everyone know that you are part of a Property Marking and Registration Scheme. Put a poster in your caravan window or sticker advertising the fact. Ask your Holiday Park for details about the police approved database on which you can register your possessions free of charge. If there is a locally managed scheme, join it. Local thieves are aware of them and will avoid parks that run them. And by advertising your membership of any property marking scheme you will also be helping with the Static Caravan security of other caravan owners on site by putting off potential burglars. These are simple ways to protect your static caravan and I think we all agree it’s best to be safe than sorry. For more information about security measures for static caravans contact us at North Wales Caravans. Make sure the caravan is well ventilated, and to avoid a build-up of poisonous gases do not cover or block up vents. Ensure all appliances are turned off at night before you go to bed to minimise the risk of fire. Don’t leave pans unattended when cooking and take extra care when small children are in the kitchen area of your caravan. Acquaint yourself with the Caravan Park’s Emergency policies and check the location of your nearest Fire Assembly Point. Site Reception will be able to provide this information for you. Although, in any event, prevention is better than a cure, should a small fire break out in your caravan, having the following safety devices close to hand can aid the situation until help arrives. It is recommended that you have at least one extinguisher in your caravan, within easy reach, preferably in the kitchen area. Always have a minimum of one smoke alarm fitted in your caravan holiday home to give advance warning, sometimes the first alert if a fire breaks out at night. Check and change the batteries each year. Keep a torch handy for emergencies. Carbon Monoxide is a highly poisonous gas; you cannot see it, taste it or smell it, yet it can cause death by asphyxiation or poisoning within a matter of minutes. Always have an approved Carbon Monoxide Alarm installed in your static caravan. Most holiday parks now recommend that for your own safety you have an annual check carried out by a competent Gas Safe Registered person on your Gas Fire and Boiler. They will inspect and clean the appliance and issue you with a certificate of compliance. This is compulsory if you intend to rent your caravan holiday home out. BBQs are a great way of cooking while at your caravan; nothing beats the smell of roasting sausages on the grill but undercooked food, or food that has been left out in the sun for too long, can be very dangerous to eat. It can cause food poisoning and is a sure-fire way to spoil your holiday. In the event of a major incident, your caravan insurance should cover you for most aspects caused by an emergency situation. Ensure that your Policy is current and up to date. The majority of caravans use Propane gas cylinders for cooking and heating facilities. Make sure the gas connection pipe is secure, the gas bottles are stored and fixed in a safe and secure place, and keep flammable items away from cylinders at all times. Only change a gas cylinder when it is completely empty; your Site Maintenance team should be able to help you with this task. Let us know if you have any additional tips for protecting your static caravan and we will add them here.